Dialectical materialism is the philosophical expression of Marxism and Marxism-Leninism. 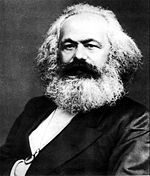 The name refers to the notion that Marxism is a materialist worldview with a dialectical method. It was developed by Karl Marx and Frederick Engels in the mid-late eighteenth century and further elaborated by later Marxist theorists. Dialectical materialism holds that the world, including human beings, is "matter in motion" and that progress occurs through struggle. It follows the Hegelian principle of the philosophy of history, namely the development of the thesis into its antithesis, which is in turn superseded by a synthesis that conserves aspects of the thesis and the antithesis while at the same time abolishing them. While retaining Hegel's dialectical method, however, Marx and Engels reacted against Hegel's idealism. Thus, history is not the result of the progressive unfolding of the Spirit, but of class struggle in society, in which economics is the determining factor. Moreover, while quantitative change may be gradual, qualitative change involves an abrupt, violent leap to a higher stage. In society, this means that only violent revolution can bring about the shift from private ownership to socialism and communism which Marx and Engels envisioned. Dialectical materialism was debated and criticized by various Marxist philosophers, which led to a number of political and philosophical struggles in the Marxist movement in general and in the Comintern in particular. After the success of the Russian Revolution in 1917, the proper interpretation of dialectical materialism became a subject of state policy. The official Soviet version of dialectical materialism, as codified by Josef Stalin was known as diamat. It became the official philosophy of the Soviet state and had a major influence on Soviet intellectual tradition, which was required to adhere to its teachings as official dogma. Hundreds of millions of people were indoctrinated in the principles of dialectical materialism in the Soviet Union and China during the twentieth century. Like other materialists of their day, Marx and Engels asserted the primacy of the material world: in short, matter precedes thought. Thus, there is no God who conceived the world, but rather humans, who are essentially material beings, conceived God. In addition, there is no spiritual world, heaven, or hell, beyond the material world. All phenomena in the universe consist of "matter in motion." All things are interconnected and develop in accordance with natural law. The physical world is an objective reality and exists independently of our perception of it. Perception is thus a reflection of the material world in the brain, and the world is truly knowable, when objectively perceived. The ideal is nothing else than the material world reflected by the human mind, and translated into forms of thought (Karl Marx, Das Kapital, Vol. 1). Marx thus endorsed a materialist philosophy against Hegel's idealism. However, he also criticized classical materialism as type idealist philosophy. According to his and Engels' Theses on Feuerbach (1845), philosophy had to stop "interpreting" the world in endless metaphysical debates, in order to start "transforming" the world. The rising workers' movement, observed by Engels in England and by Marx in France and Germany, was engaging in precisely that transformational revolution. Historical materialism—the application of dialectical materialism to the analysis of history—thus affords primacy to class struggle over philosophy per se. Philosophy, in fact, is not an objective science but a partisan political act. In this sense, classical materialism—which tended to justify the social status quo—was no better than the outright Idealism of Kant or Hegel's philosophies. "True" philosophy must take the correct position in the class struggle, and the function of Marxist philosophy is to do exact that. The materialism of Marx and Engels later opened up the way for the Frankfurt School's critical theory, which combined philosophy with the social sciences in an attempt to diagnose the ailments of society. In the later Marxist movement centering on the Soviet Union, however, dialectical materialism would be reduced to the orthodox Marxist theory known as diamat. The first of these laws was also seen by both Hegel and Lenin as the central feature of a dialectical understanding of things. It has been traced to the ancient Greek philosopher Heraclitus. The second is taken by Hegel from Aristotle, and may be traced to the ancient Ionian philosophers (particularly Anaximenes), from whom Aristotle inherited the concept. The third, the negation of the negation, is Hegel's distinct expression. It refers to the idea a thesis generating its antithesis or negation, which is in turn negated by a synthesis. The universe is not a disconnected mix of things isolated from each other, but an integral whole, with the result that things are interdependent. The natural world, from its smallest to its largest component, is in a state of constant motion. All things contain within themselves internal contradictions, which are the primary cause of motion, change, and development in the world. Development is a process whereby insignificant and imperceptible quantitative changes lead to fundamental, qualitative changes. Qualitative changes, however, do not change gradually, but rapidly and abruptly, in the form of a leap from one state to another. Being concerned primarily with history and society rather than philosophy per se, Marx and Engels were particularly concerned with the application of their philosophy to historical and political reality. The result came to be known as historical materialism. According to this theory, the primitive communism of tribal societies represented the original "thesis" of human development. This generated the antithesis of private ownership and class society. The synthesis—emerging after various stages of historical development such as slavery, feudalism, mercantilism, and capitalism—will be advanced communism, in which the workers own the means of production in an advanced industrialized society. However, just as a chick must break out of the shell which both protects and encases it, the working class must break free from the institutions of repression which capitalist society has created in order to perpetuate itself. Because such qualitative changes are always sudden and violent, this necessitates a violent revolution and the establishment of a dictatorship of the proletariat as a first step to achieving first socialism, and then the gradual withering away of the state into advanced communism. It is not the consciousness of men that determines their existence, but their social existence that determines their consciousness (Karl Marx, Preface to A Contribution to the Critique of Political Economy). He also took on several Marxist thinkers whom he deemed to have improperly understood the implications of dialectical and historical materialism, resulting in their adopting an insufficient revolutionary outlook based on gradual change and "bourgeois-democratic" socialism. 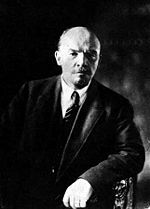 Lenin insisted that gradualism could never achieve qualitative change in the economic base of society. We stand for the withering away of the state. At the same time we stand for the… strongest state power that has ever existed… Is this “contradictory”? Yes, it is contradictory. But this contradiction… fully reflects Marx’s dialectics. Stalin then established the official Soviet version of dialectical materialism in his work, Dialectical and Historical Materialism (1938). Here, he enumerated the "laws of dialectics," which are to serve as the grounds of particular scientific disciplines, especially sociology and the "science" of history, thus guaranteeing their conformity with what he called the "proletarian conception of the world." Thus, the official Soviet philosophy of diamat was imposed on most Communist parties affiliated to the Third International. Under the Stalinist regime and its successors, academic discussion in Soviet intellectual institutions and journals would be constrained to stay within the line of Stalinist philosophical orthodoxy. Nevertheless, the doctrine of dialectical materialism, especially the official Soviet version of diamat, has been criticized by numerous Marxist thinkers. Marxist philosopher Antonio Gramsci, for example, proposed a "philosophy of praxis" in its stead. Other thinkers in Marxist philosophy have pointed to the original texts of Marx and Engels, pointing out that traditional dialectical materialism was much more a product of Engels than of Marx. This has resulted in various "Marxist" philosophical projects which present alternatives to traditional dialectical materialism. As early as 1937, Mao Zedong proposed yet another interpretation, in his essay On Contradiction, in which he rejected Engels' "laws of dialectics" as oversimplified and insisted on the complexity of the contradiction. Mao's text inspired Louis Althusser's work on contradiction, which was a driving theme in his well-known essay For Marx (1965). Althusser attempted to nuance the Marxist concept of contradiction by borrowing the concept of "overdetermination" from psychoanalysis. He criticized the Stalinist "teleological" reading of Marx as a return to Hegel's idealism in which philosophy supersedes reality. Another school of thought, led by Italian philosopher Ludovico Geymonat, constructed a "historical epistemology" from dialectical materialism. For more than 70 years in the Soviet Union and its satellite countries, dialectical materialism was the official guiding philosophy of state. It attempted to deal with all questions of existence, from atoms to history and economics. It became them most important atheistic ideology of the twentieth century, absolutely denying even the possibility of God's existence and affirming the need for violent revolution that would do away with religion, which it insisted was merely the "opiate" of the masses. More than a billion young people in the former Soviet Union, China, and many other countries were indoctrinated into the worldview of dialectical materialism in schools from kindergarten through college. In the context of the totalitarian societies which it spawned, dialectical materialism stifled the creative spirit of two entire generations who grew up under Soviet-style rule. The former Communist world even today is still struggling to recover from dialectical materialism's tragic legacy, a philosophy designed to liberate the workers of the world but which itself ended up in the dust bin of history. ↑ Josef Stalin, Dialectical and Historical Materialism. Retrieved November 5, 2008. Ollman, Bertell, and Tony Smith. Dialectics for the New Century. Basingstoke:: Palgrave Macmillan, 2008. ISBN 9780230535312. Rigby, S. H. Engels and the Formation of Marxism: History, Dialectics and Revolution. Manchester, UK: Manchester University Press, 2007. ISBN 9780719077746. Yi, Sang-hŏn. Communism; a Critique & Counterproposal. Washington: Freedom Leadership Foundation, 1973. OCLC 741232. This page was last modified on 24 October 2017, at 20:59.